Dillian Whyte, Dereck Chisora heading in separate directions: Whyte-Ortiz and Chisora-Helenius II? It seems fans who were hoping to see an immediate return meeting between intense British heavyweight rivals Dillian Whyte and Dereck Chisora will be disappointed. For although a rematch of the terrific 12 round battle the two engaged in back in December will always be a possibility, the two contenders have separate bouts in the pipeline. According to promoter Eddie Hearn, Whyte, who aims to get himself in line for a world title shot this year, could face Cuban southpaw Luis Ortiz soon. Speaking with Sky Sports, the Matchroom boss laid out the plans for the once-beaten Whyte. A Whyte-Ortiz match-up would be very interesting and would very possibly result in a good fight. The winner would certainly be in a position to call for a world title shot. Whyte can be very exciting to watch – see his encounters with Anthony Joshua and Chisora – and Ortiz is a dangerously powerful man. Those fans who crave a second slice of the Whyte-Chisora action might even take this fight as an acceptable alternative. As for Chisora, “Del Boy” is now targeting another revenge fight, against Robert Helenius, who decisioned him in a fan-friendly, debatable distance fight back in 2011. 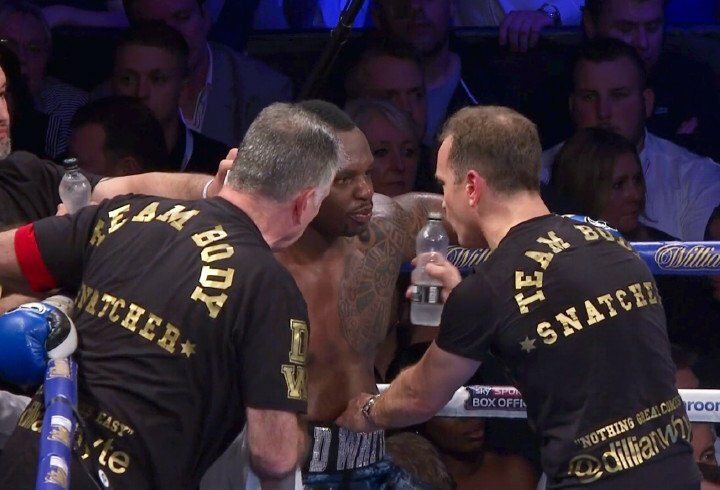 Chisora’s trainer Don Charles told Sky Sports that his fighter “needs to rectify” the defeat. Charles added that the Whyte rematch is their preference, but that “you can’t force people to fight.” A revenge win over Helenius, if he can score one, will help keep Chisora relevant. The Finn suffered a bad loss to Johann Duhaupas in April of last year, this being the sole loss of Helenius’ pro career, but he has won his last two. Can Chisora get revenge or will “The Nordic Nightmare” repeat his controversial win? You are here: Home / Boxing News / Dillian Whyte, Dereck Chisora heading in separate directions: Whyte-Ortiz and Chisora-Helenius II?